Journal is a business diary in which all financial data pertaining to the day to day business transactions of a firm is recorded using double-entry bookkeeping system. Depending on the nature of its operations and number of daily transactions, a company may keep several types of specialized journals such as cash journal (cash book), purchases journal, and sales journal. All accounting transactions are recorded through journal entries that show account names, amounts, and whether those accounts are recorded in debit or credit side of accounts. Accounts receivable is the money that a company has a right to receive because it had provided customers with goods and/or services. Accounts payable is money owed by a business to its suppliers, shown as a liability on a company’s balance sheet. 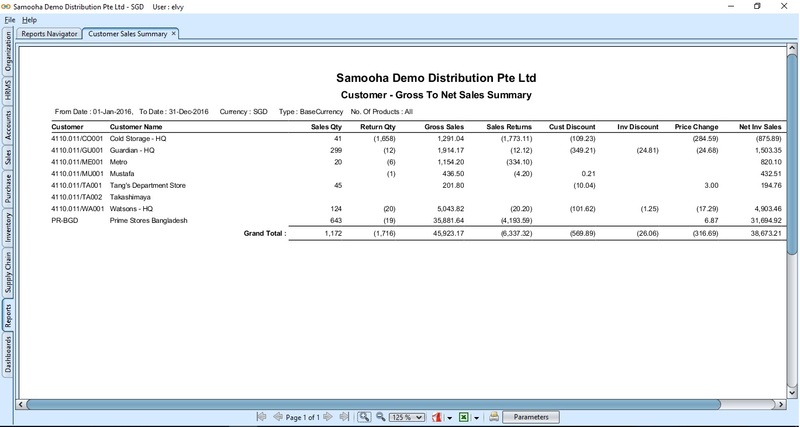 Customers view allows the user to manage the company customer’s records. A vendor, or a supplier, is a supply chain management term that means person who provides goods or services to a company. Create and manage internal employees’ details. Non trade receivables are amounts due for payment to an entity other than its normal customer invoices for merchandise shipped or services. The debit memo is essentially an incremental billing for the amount that should have been included in the original invoice. This usage is not common, since many companies simply re-issue the original invoice with an adjustment. Credit memo is issued by a seller in order to reduce the amount that a customer owes from a previously issued sales invoice. Create records of bank & banks accounts used by the company. Assets view allows user to record and manage the company’s assets. User can also sell / dispose asset (record) here. Creation of new assets are mainly done when it is purchased (see “Accounts – (Transactions) Non Trade Invoice” for more details), but user can create assets records from this view as well, e.g. for carry-over asset or receive asset from another company. A cost center is a sub-unit of a company that is responsible only for its costs. 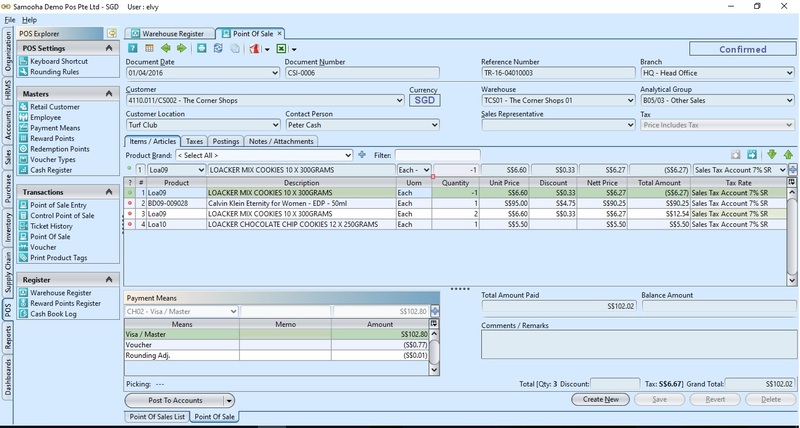 Example of cost centers are the production departments and the service departments within a factory and administrative departments such as IT and accounting. 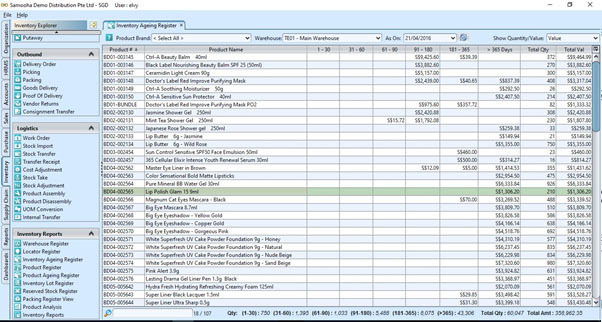 Product Cost Planning (CO-PC-PCP) is an area within Product Cost Controlling (CO-PC) where you can plan costs for materials without reference to orders, and set prices for materials and other cost accounting objects. 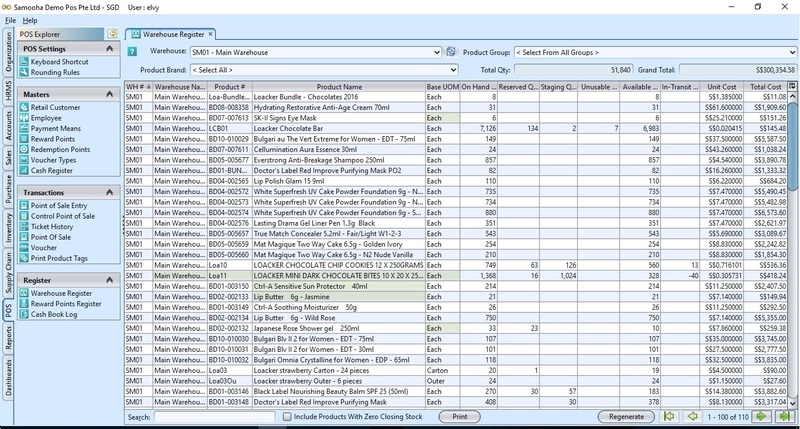 Product Standard Cost view allows user to create and manage lists of products standard cost for different period of time. Standard cost is a fixed cost that is defined (both in purchasing currency and functional currency) for a period (quarter, fiscal year) and which will provide a basis upon which the actual cost (this being the cost that is incurred for each purchase) will be measured. 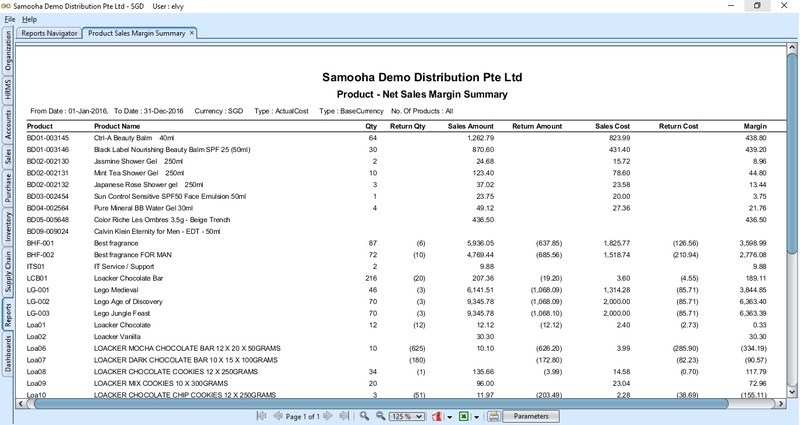 It allows to quickly see variations (Purchase Price Variance and Forex variation impact) with what had been used in the planning of the cost and provide management with an effective mean of ensuring that if large variation occur, corrective measures (selling price increase being one) can be made to maintain projected margins. Profitability analysis is a component of enterprise resource planning (ERP) that allows administrators to optimize the profitability of an existing project. Profitability analysis can anticipate sales and profit potential specific to aspects of the market such as customer groups, geographic regions, or product types. A profit center is a subunit of a company that is responsible for revenues and costs. Often a division of a company is a profit center because it has control over its revenues, costs, and the resulting profits. Enterprise control combines the strength of both business processes and production operations processes. It is the deliberate act of synchronizing business strategy with operational execution in real-time to enable closed loop business control across an enterprise. Enterprise control is the ability to combine control, intelligence and process management to enable business optimization that is inclusive of business and production operations. The company Budgets both for the fiscal year and for the open to buy can be set up and monitored using the budget application. The act of obtaining or buying goods and services. The process includes preparation and processing of a demand as well as the end receipt and approval of payment. Sales Price List view allows user to manage product’s selling price list. 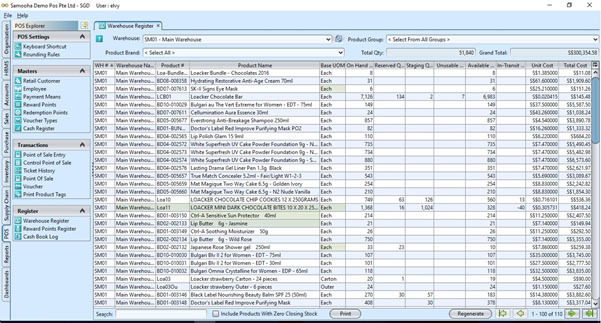 Vendor Product Mapping view allows the user to create and manage mapping scheme to associate vendor’s products’ numbers with company’s products’ numbers. It supports the procurement and inventory functions occurring in day-to-day business operations. It contains many aspects such as purchasing, goods receiving, material storage, consumption-based planning and inventory. 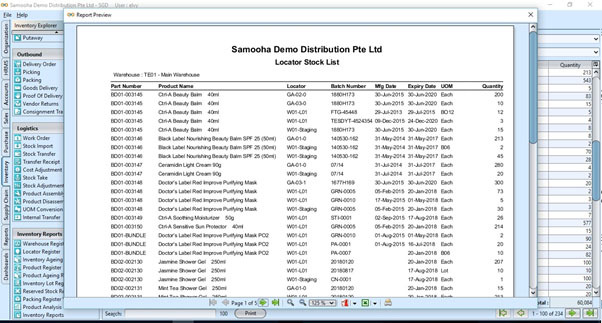 It also fully integrated others modules in GOOMI such as Finance, Sales & Distribution and Warehouse Management. In most goods movements in Inventory Management, the stock quantity and therefore also the stock value vary. In goods receipts, the stock value increases; in goods issues, the stock value decreases. The quantity and value of the material stock and the material price (=valuation price) are updated in the material master record. You therefore also need a material master record for warehouse material. The material valuation determines and maintains the stock value of a material. 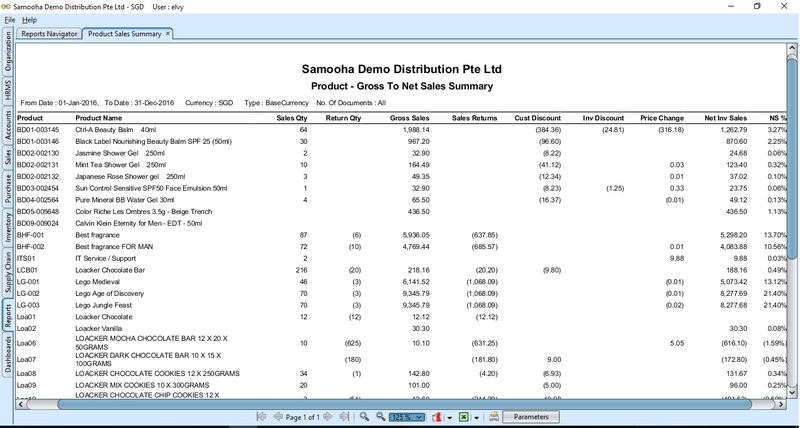 Sales Order view allows user to create and manage sales order documents which included how to create, update, edit, view and search the details. The trading terms are used to allow the business to keep track of trading terms to use in relation to the buyer. The customer product mapping allows user to create mapping scheme to associate customer’s products’ numbers with company’s products’ numbers. It allows the user to manage promotion for sales process. The Delivery Order view allows the user to view and manage the company’s outbound orders. 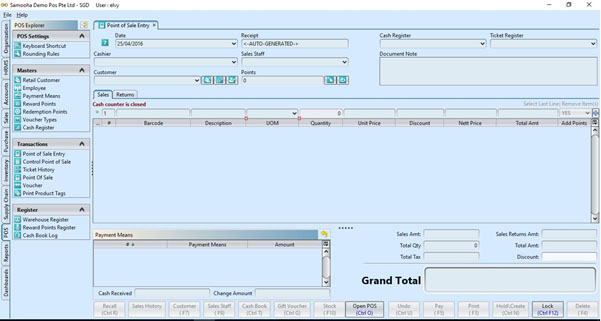 A sales invoice is a document that a company uses to communicate to their customers about the sums that are due in exchange for goods that have been sold. Sales Invoice view allows user to create and manage sales invoices. A credit note or credit memorandum (memo) is a commercial document issued by a seller to a buyer. 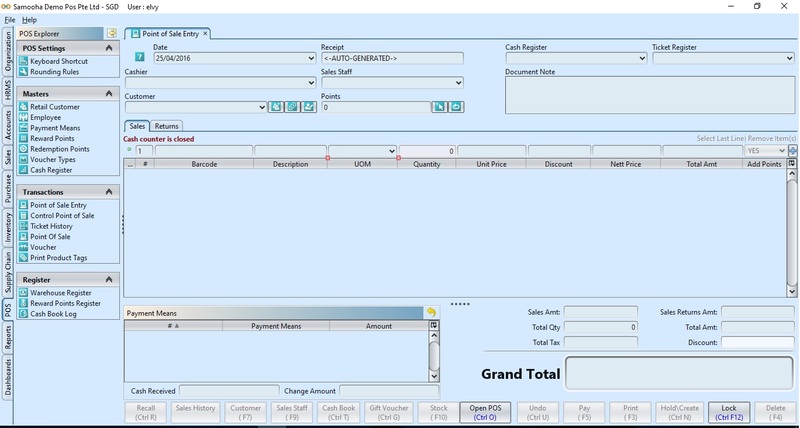 User can create and manage credit notes using this transaction. The Sales Information System is a flexible tool which allows you to collect, consolidates, and utilizes data from Sales and Distribution processing. It can be used at different levels in the decision-making process as a control and planning instrument, enabling you to recognize market developments and economic trends early on and to take appropriate measures. Company’s inventory inbound transactions process for inbound stock activities. The Receipt Order application allows the user to receipt Goods in an inbound mode into the warehouse. The receipt order will be generated based on the purchase invoice of the ordered goods. 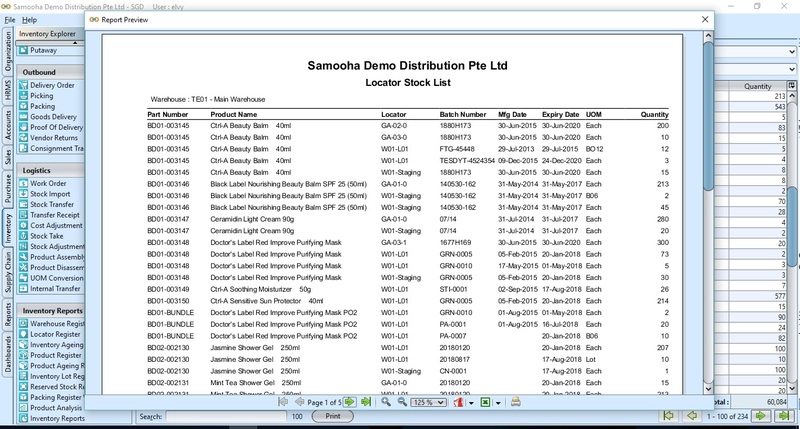 It allows user to track stock take progress in a warehouse and update the inventory information (i.e. quantity, batch number, expiry date) based on the stock take report. Variance in the quantity and value can be viewed in the report after Stock Take process is completed. The work order is only enabled when the scanner application is enabled in the company/inventory settings. It will then change the picking and packing workflow to introduce work orders. Work Orders can be generated as one to one or as one to many for picking. They then can be assigned and released for processing by the warehouse operators. It integrated with Inventory module such as word order, picking and packing. Kitting is the process of building kit products by assembling their component materials (raw materials, semi-finished products or finished products). 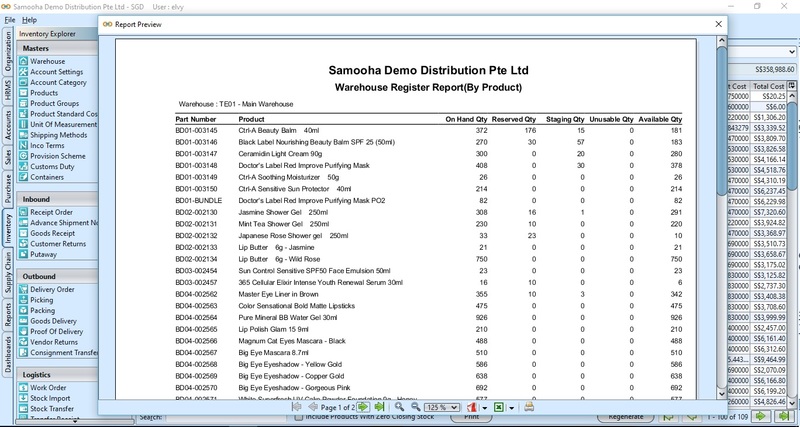 The Product Assembly view allows user to process assembling of products into another product at the warehouse. The Product Disassembly view allows user to process dis-assembling of product into its parts at the warehouse. From inventory control, shipping and receiving, to order fulfillment, a Warehouse Management is vital to improving the efficiency of a company’s warehouse operations. A comprehensive warehouse management system helps streamline multiple functions of your enterprise which included receiving, goods receipt and putaway. A database used for storing and administering all types of data required for efficient and accurate warehouse inventory management. 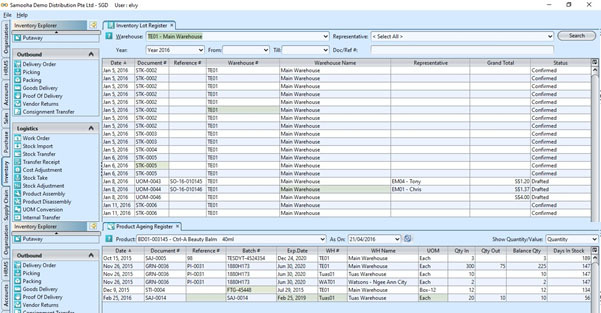 This may include modules or fields for keeping track of all items and locations, duration of inventory, products’ transactions history, and more. 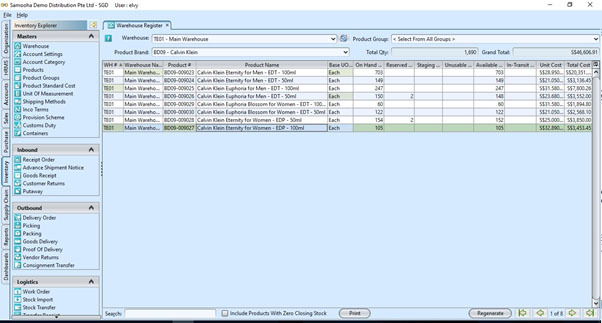 The purpose of the Demand Group application in the Master set menu allows the user to create group codes, which can be attached to customers for analyzing the demand, supply planning and reporting. The purpose of the forecasting group is to allow the user to create forecast for the group of products, which will be analyzed in order to create the supply requirements. In the Master setup the Day of Coverage the teams need to define the Minimum Days of Coverage (Min DOC), Average Days of Coverage (Avg Doc) and Maximum Days of Coverage (Max Doc). 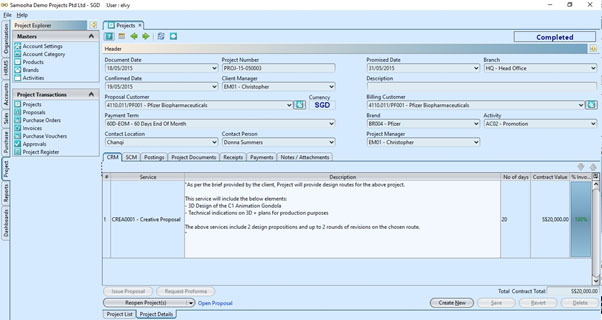 The teams are able to create and manage vendor setup records in the vendor master setup in Supply Chain Master. The product settings is where the user can create a product mapping to the selected product category from a Vendor. The user are able to create new, Save, Revert and Delete a record. This is also where user the Minimum Order Quantity and the Order Pack Quantity is also encoded. 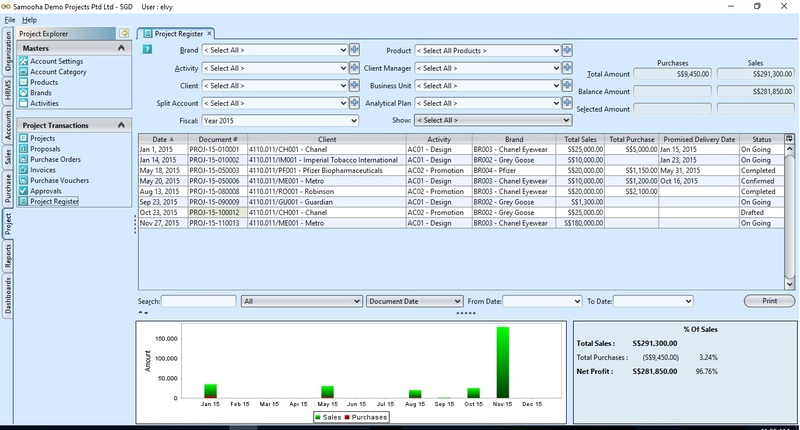 The Sales Trend Model application allows the user to develop Trends quickly, to analyze your sales by month, quarter and year. Compare your data not only by this year’s performance, but by year-to-year-periods, as well. This will assists in the demand planning for product trending over a period of time and stock purchasing accuracy will be greatly improved. The Sales Forecasting uses embedded analytic which are the key that enables for the VP of sales, sales operations and front-end sales organizations to move from a culture based only on gut feeling and perception-based excels decision making to one based on factual data supporting tactical and strategic decision making. It all start with defining the Demand Planning, with the creation of the Sales Forecast List. The user can create different demand groups that are linked to forecast groups. 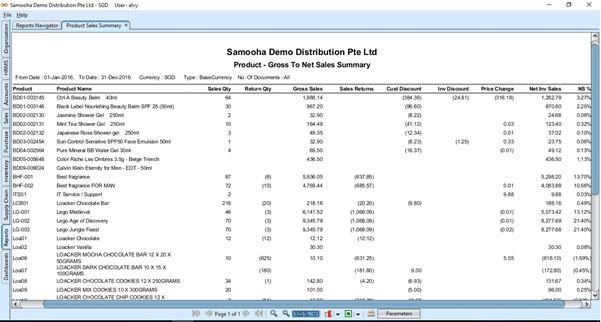 Once the sales forecast list is created the sales forecast reporting can be activated using the different selected parameters in the sales forecast applications. In the purchase forecast application there are two folders: Purchase Forecast List and Purchase Forecast. In the purchase forecast list the users are able to view the lists of Purchase Forecast, which have different statuses i.e in the Show: Purchases Order Not Created and Purchase Order Created. In the Statuses they can select Draft/Confirm, Draft, Confirm, Approved, Accepted and Closed. It is an approach to managing company’s interaction with current and future customers. The approach tries to analyse data about customers’ history with the company. The Samooha’s retails customer CRM able to help company to analyse their customers in one view and improve the relationship between customer and company. Get real-time access to Point Of Sale transactions, inventory control, purchasing, inter-store and warehouse to store Real-time stock transfers, cash management and many other functions related to the operation of a successful & efficient retail organization. 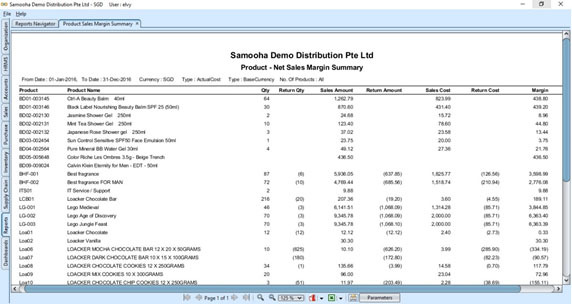 Samooha G.POS is a point-of-sale (POS) system that is designed to work directly with your ERP system. 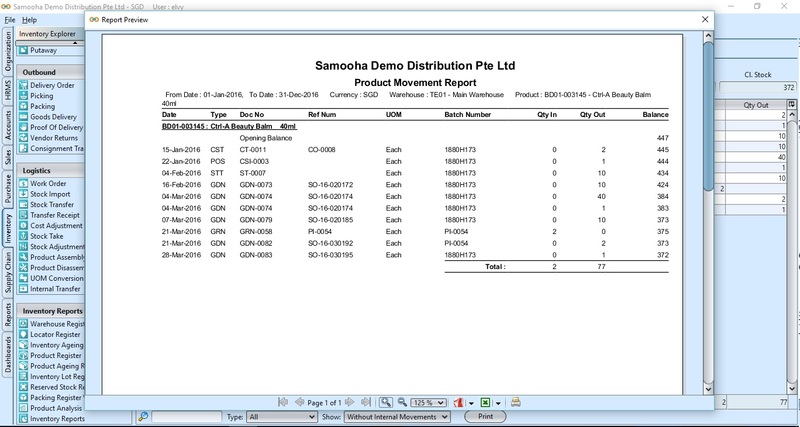 It is simple to use and fully integrates with Samooha GOOMI ERP system. With the G.POS, you can ring up sales on the go or from inside your retail or company store. G.POS delivers the untethered shopping experience that consumers have come to expect. Samooha’s POS (G.POS) supports a very large choice of credit cards including VISA, MasterCard and American Express. Serve your international customers anywhere and boost sales locally with all the preferred local payment methods. A loyalty program is a rewards program offered by a company to customers who frequently make purchases. There are few features under Samooha G.POS’ loyalty program so the company is able to award all the loyalty customers. Reward Points view allow user to set reward points scheme to reward customers based on their purchase. Redemption Points view allow user to set redemption points scheme for customers to redeem their loyalty / reward points for loyalty voucher with monetary value. Voucher Types view allow user to create and manage different type of retail voucher with monetary value. 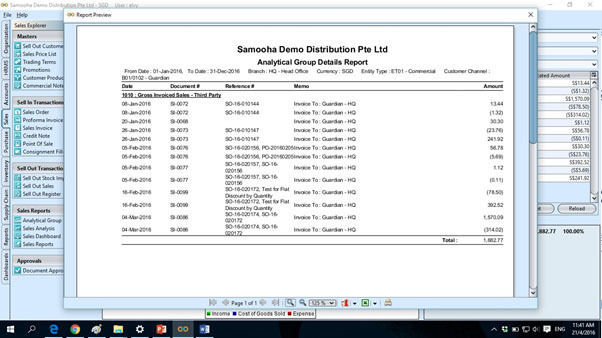 Company is able to manage the voucher well by using Samooha G.POS. It able to create, edit, delete, and manage different type of retail voucher with monetary value. Many businesses, whether a large chain store or a small “mom-and-pop” shop, have to deal with returns of merchandise because sold items may be broken or damaged. It is important for employees how to deal with this kind so it is able to control the rate of return case. Knowledge and video, how to manage a Customer returning a purchased Item in POS? The company will have full view about the retail by the summary and detailed view of customers’ reward points history, cash book log of cash registers and warehouse register. Project management will help your organization to manage projects from start to finish, and allow employees at different levels to have an input into the process. 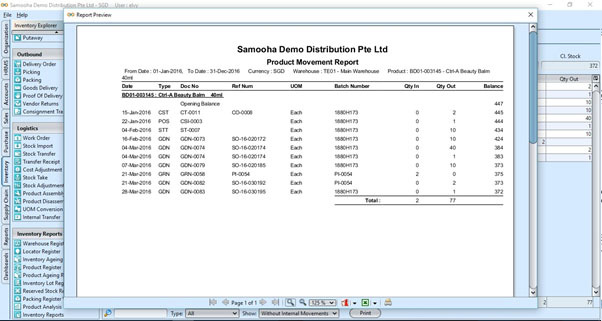 By using Samooha G.PM module, it is able to help the company manages the project through its entire process, from planning, to discussion the details, to execute and completing the project. The Project Profitability report is used to monitor the planned and real cost related to a project which included budget, gross margin and etc. Suppliers play important role to deliver projects, but managing supplier performance can be challenging at the best of times! 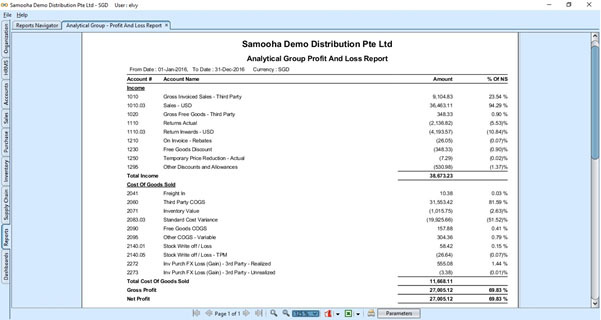 Samooha G.PM can helps the company have a clear view and summary about the process. Customer relationship management (CRM) is an approach to managing a company’s interaction with current and future customers. Samooha G.PM has clear view of the project, so the project manager will be easier to manage. Project controls are the data gathering, management and analytical processes used to predict, understand and constructively influence the time and cost outcomes of a project or program; through the communication of information in formats that assist effective management and decision making. This definition encompasses all stages of a project or program’s lifecycle from the initial estimating needed to ‘size’ a proposed project, through to reflective learning (lessons learned) and the forensic analysis needed to understand the causes of failure (and develop claims).